Obama Trade Push runs aground as House Democrats Derail Bill. But that is the public messaging on which to build for 2016. The Democrat message for 2016 is income inequality and trade bills supposedly exacerbate US income gaps. At least as far as the messaging goes. This Trade Bill House vote will be referred to during the 2016 Election season as an example of the principled fight the Democrats wage for the working man & woman, even against their own President, when he sides with the evil empire, the Republicans. Even going so far as to point out ‘slavery clauses” in the agreement. Even if we eventually (there is more negotiating going on as we speak) allow the bill to pass, the next Democrat President will be this principled person for you. Lets separate from a President who is losing support in the public eye. – It also underscored the waning influence of a second-term president. Republicans siding with the President, what, are dogs and cats now friends? And, the President is siding with the Republicans for his legacy, not for you. – Republicans continued to stand in Obama’s corner on Friday. “Is America going to shape the global economy, or is it going to shape us?” said Ryan, the Wisconsin Republican who is head of the House Ways and Means Committee and a GOP point man on an issue that scrambled the normal party alignment in divided government. – “Republicans did our part, and we remain committed to free trade because it is critical to creating jobs and growing our economy. Why did Democrats vote against this bill? – Others said the defeat had more to do with policy and politics. After decades of watching presidents secure trade agreements from South Korea to Mexico, even in the face of opposition from their base, Democrats have broadly come to the conclusion that such agreements exacerbate income inequality. 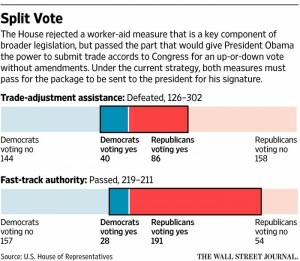 – The key vote Friday was on the so-called Trade Adjustment Assistance bill, a program that retrains workers displaced by trade. The bill was originally put on the table as a sweetener to help get Democrats on board and ultimately move the “fast-track” bill. But Democrats are so opposed to that legislation, all but 40 opposed the sweetener. – The coming days are expected to include a new frenzy of lobbying by both sides, as Mr. Obama and his allies on trade get a second chance. – “Unless this is promptly remedied with an affirmative vote cast soon, it is doubtful that TPP partners will be willing to seriously re-engage,” said Daniel Price, former economic adviser to President George W. Bush and managing director at Rock Creek Global Advisers, a consultancy. Watch as this evolves over the next 18 months.